It’s with a sheepish grin that I arrive late for The Heavy’s House party, but better late than never, eh? The Bath, England group’s 2009 album adds a fresh chapter to the garage rock revival story by dialing up the soul. I should mention that I first heard of the group by way of Kia’s 2010 Super Bowl commercial, featuring James Brown/Jack White mashup “How You Like Me Now?” In fact, I thought the song was a Jack White love-and-theft tribute to Brown, with its punchy horns and funky guitar rake-strums. It reminded me of a slowed-down take on the rushing “There Was a Time, ” which the singer coyly (and wisely) name-checks in the first verse. As much of a throw-back as it seemed, I assumed it to be part of some intriguing, new direction for one of White’s myriad side projects and put off figuring out what album it appeared on until later. Only in the last few days did I discover the error of my assumption, and I’m no less happy for it. And, really, the music and vision of Jack White and those of The Heavy intersect meaningfully in primordial rock, impassioned vocals, pounding drums, and gritty electric guitar. 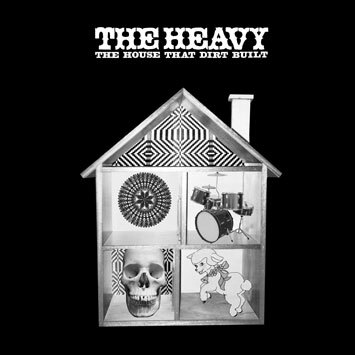 The House That Dirt Built is that rare breed of animal: an album that caters to crate-digging fans of 60’s/70’s soul and rock while creating something original from those stylistic elements by drawing from more contemporary wells like those of punk and hip-hop. Their house is an impressive, fine-and-funky house.